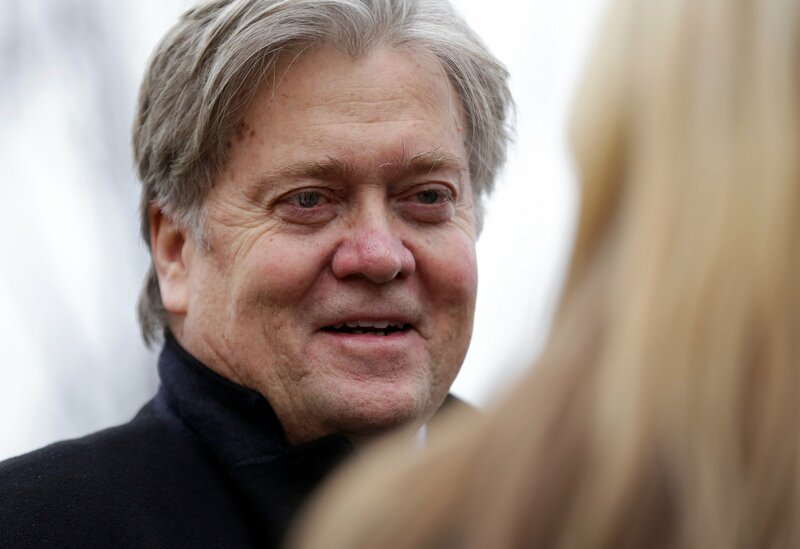 If you judge President Donald Trump by his inaugural address, you can say that Steve Bannon, his nationalist adviser, is winning the battle for his soul. Trump’s 16-minute address was ferocious in its denunciations of Washington: “Politicians prospered while the jobs left and the factories closed.” He denounced politicians who are “all talk and no action.” Trump added: “For too long a small group in our nation's capital have reaped the rewards of government.” And he promised: “The forgotten men and women of this country are forgotten no more.” He gestured with a clenched fist as the speech ended. The new president portrayed a nation that is “ravaged,” one where “rusted out factories are scattered like tombstones.” He took aim at “crime and gangs and drugs,” promising to end this scourge. The economic recovery of the past eight years went unacknowledged. He mentioned “welfare” as if it was an entitlement, something it hasn’t been since the 1990s. Trump made “America First” the center of his address. The tacit message to the ex-presidents gathered on the west side of the Capitol, and to all of the politicians there, Republicans as much as Democrats, was that they had not put the nation first in the formation of its trade, immigration and defense policies. “From this day forward, it’s only going to be America first,” Trump said. There were feints at healing—a mention of the Obamas helping with the transition but none of the Clintons who were seated nearby—and there were welcome denunciations of prejudice. But American allies were probably not left reassured. He vowed to “reinforce old alliances,” but the reference to developing “new ones” might have struck many in Eastern Europe as a tip of the hat to Russia. Trump’s address may have dispensed with his usual “I” talk focused more on the country as a whole, but it was a speech that made him the tribune of the people and portrayed both parties as the establishment. Now we’ll see if other advisers can lay claim to Trump’s brain. Will the internationalists like General James Mattis, the defense secretary nominee, push a more traditional foreign-policy message? Will House Speaker Paul Ryan tame the anti-immigration tone or the promises of a massive infrastructure program? Will Trump take on a sunnier tone, like that pushed by Kellyanne Conway? As of now, it’s Steve Bannon who is winning. Inauguration Demonstrators Make Presence Felt in D.C.